Aid’s future, its history, and its impact were the topics of a policy workshop held by UNU-WIDER in co-operation with the Embassy of Denmark in Dar es Salaam on 8 June. 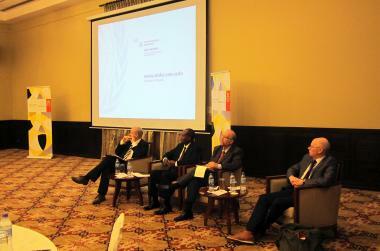 The Dar symposium brought together a range of international and local participants, including donors and policy makers, and was opened by Johnny Flentø, Denmark’s ambassador to Tanzania. Africa has now seen over a decade of economic progress. For many countries strong growth has combined with macroeconomic improvement and higher tax revenues to deliver rising living standards. The region is receiving more foreign direct investment than ever, and other sources of private development finance are on the rise. This has led many to question the role and future for foreign aid. Myles Wickstead, formerly Head of Secretariat to the Commission for Africa, and previously the UK’s ambassador to Ethiopia, spoke about how aid has evolved over the years, both politically and within the context of changing ideas about development. UNU-WIDER’s director, Finn Tarp, presented on what we now know about the impact of aid, growth, and development. Finn has a series of papers with Channing Arndt, Sam Jones and other colleagues which provide very solid evidence on aid’s generally positive growth impact (check out the new UNU-WIDER special issue of World Development on this: it’s edited by Finn and myself, and is open access). 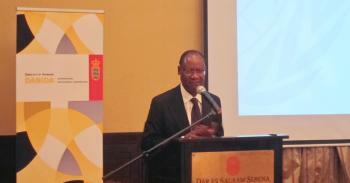 Rwekaza Mukandala, Vice Chancellor of the University of Dar es Salaam, spoke about donor relationships. I then talked about some of the difficult choices that have to be made as aid donors look to their future strategies (with some of them cutting their budgets, too). A Tanzanian perspective was provided by the Vice Chancellor of the University of Dar es Salaam, Rwekaza Mukandala, who spoke about his country’s sometimes rocky relationship with the donors over the years. Aidan Eyakuze of Twaweza moderated the meeting with panache and humour. What are the key challenges ahead for the development community in Africa? and to make better use of the natural wealth of the region. Despite success, poverty remains deep and potentially destabilizing to democracy. These are very good reasons for the focus of the UNU-WIDER 2014-18 work programme to be on structural transformation and inclusion. The rise of ‘non-traditional donors’ (both official and philanthropic) is too often seen as competition for traditional (OECD-DAC) donors, but in reality there is much scope for co-operation to the benefit of recipients. Official finance still has a major role to play in helping to mobilize more private development finance, especially in infrastructure where neither domestic revenue nor aid provides sufficient funding alone. The Asian Infrastructure Investment Bank, led by China, is a promising step forward. Myles Wickstead, Rwekaza Mukandala, Finn Tarp, and Tony Addison. The symposium came at an important year for Africa, and indeed for Tanzania which is shortly to ​hold elections. The slide in global commodity prices is putting stress on the public finances of resource-dependent countries. Ebola-hit countries will need much support to restore their hard-won progress. Countries need to position themselves effectively on what they want from the donor community, and in the process to finalize the SDGs in succession to the MDGs, which will be completed later this year. You can expect more debate via UNU-WIDER on what aid has achieved, what it can do better, and what it might do in the future. In the meantime, do check out our website for the latest research and views.